But Ended Up Winning The War! Various revisions of the original Times contract culminated with terms that would ultimately seal König’s fate in England and usher forth competition from English engineers. In essence, the revised November 19, 1816, agreement lifted all restrictions upon Walter to use anyone he wished to work on or repair the König presses. The revision restricted the patentees from selling similar machines to any morning papers for less than £1,000 each. These roadblocks would hamper König and he was dejected and heartbroken at what he saw as a betrayal by his now chief partner Bensley (who negotiated the deal) to relegate him to the sidelines. For Bensley, he was not restricted to use the Koenig machines himself. Although Walter’s revised contract stipulated payments (to Walter) if the König press was sold to other papers, Bensley refused to allow König to do so! There was seemingly nothing more the two Germans could do in England. 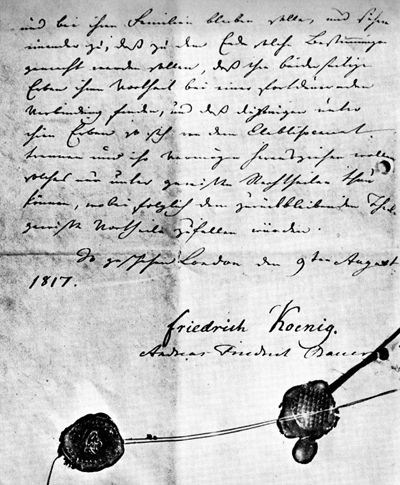 Totally dejected, on August 9, 1817 König and Bauer, while still in London, put pen to paper and formalized their partnership establishing a new company: KÖNIG & BAUER. The very next day, König left England for good and settled in an unused monastery in Oberzell, just outside Würzburg in Bavaria. Less than a year later, Bauer would join him, bringing along two English lathes, some tools and an English mechanic-fitter. The problems of re-starting their business in what was then a backward country opened the door for Walter to seek help from others. William Cowper and his brother-in-law, Ambrose Applegath, would benefit the most by König’s genius. The two took out patents citing another Englishman William Nicholson’s never realized patent to skirt König’s own patents, and in the same year brought forth an improved version of König’s press while ushering in a new age of the British steam powered printing press. Nicholson has often been referenced as a “father” of the drum and bed concept. In 1790, he had applied and received a British patent but never acted on or applied it. 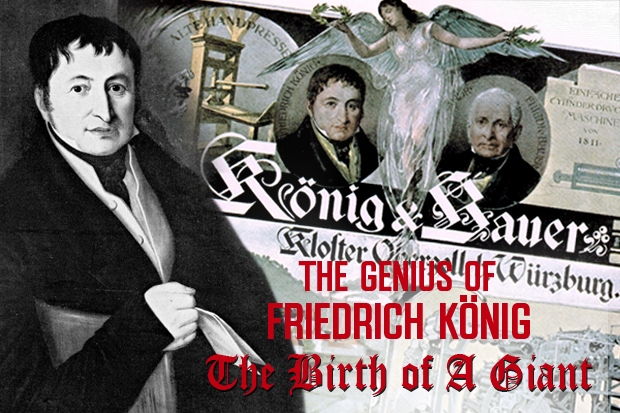 Nicholson was ignored, and certainly König had never gleaned any concepts he later put in place. British historian, James Moran, described the Nicholson ideas as “insufficient and superficial”. By 1827, Cowper and Applegath, constructed a new “Multiple Machine with Four Cylinders” which was delivering an astounding 4,000 sheets per hour at The Times of London. The ideas of which they based their press were König’s and not Nicholson’s. This deliberate slight in not citing a previous art (König’s) was a sad testament to König’s brilliance and may have even hastened his death in 1833 at only 59. After all, König was a German. There was little respect by the English for anything and anyone who wasn’t English. Through all of this, König & Bauer never brought suit from the English courts. Had they done so perhaps justice would have prevailed? König and Bauer went on to great things, as we know. The German factory continued developments and concentrated sales all over Europe. They continued to invent and bring new presses to market. But, the deceit and difficulties in England would never be forgotten by either partner. The injustice was so acute, that even by 1851, when Britain held its “Great Exhibition” at London’s famed Crystal Palace, Andreas Bauer refused to attend and display his machinery. 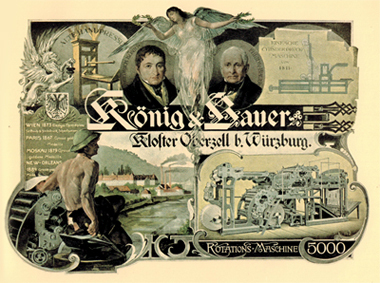 König is credited with three milestone technologies: connecting a printing press to a steam engine, using tapes to feed a sheet to the cylinder, and finally using a cylinder instead of a platen. König subsequently modified his press further with an additional cylinder to be the first to “perfect” or print both sides of the sheet in one printing. “So is the best tribute of praise, which we are capable of offering to the inventor of the printing machine, comprised in the preceding description, which we have feebly sketched, of the powers and utility of his invention. It must suffice to say farther, that he is a Saxon by birth; that his name is König; and that the invention has been executed under the direction of his friend and countryman Bauer,"
Friedrich König and Andreas Bauer would end up winning the war.